For several weeks, gilets jaunes protesters have been regular sights at roundabouts across the country - and they have inspired a new-generation character in a traditional festive industry. 'Santons' are traditional handmade clay figures using traditional methods handed down through the generations that grace Nativity scenes across Provence in particular. Now, one company has taken inspiration from the 21st century protesters and created a gilets jaunes santon - which has quickly become an international best-seller. 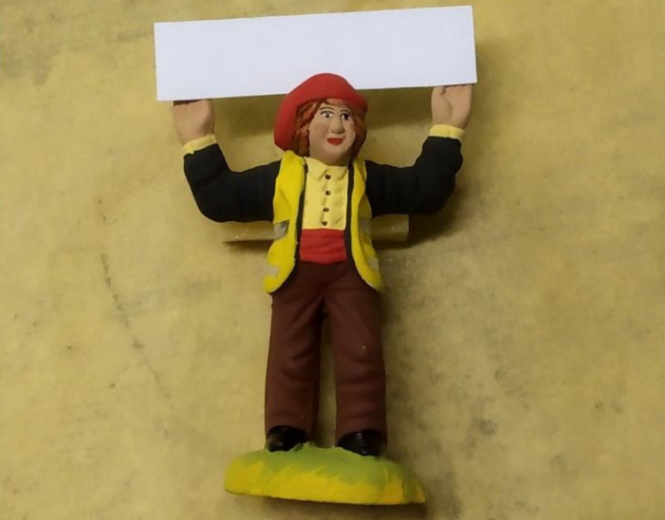 A spokesman for Marseille-based Santons Magali said that orders for the €15 figure, which carries a blank sign on which to write personal messages, were coming in from all corners of France and overseas for the made-to-order figurine. "Every Christmas, we try to have something new to offer enthusiasts and collectors. This santon was ... created at the very beginning of the movement by respecting our traditional methods. Of course, the gilets jaunes have nothing to do in the traditional Nativity scene, but it can be put elsewhere in the setting," the spokesman told La Provence newspaper.